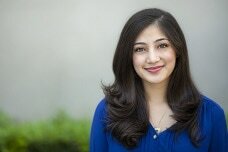 Tarana Khan is a first-year Ph.D. student in the Learning, Teaching, Cognition, and Development (LTCD) specialization. Her research will focus on motivation and achievement in adolescents. She wants to investigate the effects educators and parents have in instilling motivational values into adolescents. She plans on exploring the relationship between these influences in order to improve methods for effectively overcoming motivation and achievement barriers in at-risk populations. Tarana would also like to research how motivation varies across genders. Tarana received a B.S. in Psychology from the University of Texas at Austin with Highest Honors. She received Special Honors in Psychology for completing her honors thesis on the development of preschoolers’ perceptions of gender classification. After Tarana graduated, she worked as a Princeton Review math tutor at a low-income middle school in Austin, Texas, which greatly influenced her to pursue the psychological aspects of motivation in education. Tarana spent a year working as a research assistant at Disney’s flagship media research lab in Austin, TX called MediaScience where she facilitated quality data collection to answer research questions posed by several major television networks such as ABC and ESPN.